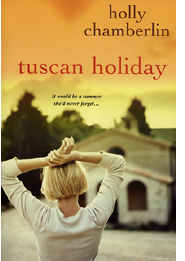 When Elizabeth Caldwell planned a trip to Florence with her daughter, Marina, she secretly hoped for a bonding experience worthy of a Lifetime movie. But Marina – twenty-one, newly graduated, and close to her mom in many ways – has always been a more practical, in control type, not given to fuzzy fantasies. Elizabeth knows Marina wants to avoid the kind of “stupid mistake” that left Elizabeth a single mother at twenty-two, and she’s bitten her tongue as Marina settles for a wealthy fiancé who gives her everything she thinks she wants. After all, Elizabeth – unable to bring herself to fully commit to the man she has dated for years – is hardly an expert in romance. Still, a lot can happen on vacation, especially in Tuscany, where every scent borne on the warm breeze inspires delight, and every view makes the heart soar. There, on the streets once walked by Dante and Michelangelo, Marina is blindsided by a gorgeous Italian named Luca who shows her how gloriously unpredictable passion can be, and Elizabeth finally lets go of the role that has defined her for so long to embrace her own uncertain future.